In this tour you will explore some of the most important sights of the historic centre of Florence like the Accademia Gallery where you can admire many paintings from the marvellous Florentine school as much as some of the most important sculptures by Michelangelo, the Duomo (internal visit) that is the world wide largest and known for its dome overlooking the church. 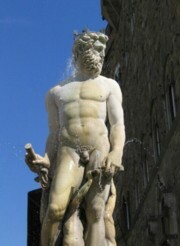 Then also the Piazza della Signoria since the twelfth century the centre of Florence’s political life . The Duomo is the abbreviation for the Basilica Santa Maria del Fiore, the cathedral of Florence, known for its great red-titled dome, the world wide largest and symbol of the city. It was designed by Arnolfo di Cambio in 1296 to beat the other great cathedrals of Pisa and Siena. The construction of this huge building lasted over 170 years. The church walls were decorated alternately with vertical and horizontal surfaces of multi-colored marble, which were taken from different cities in all Italy. The six side windows with their delicate decoration and ornaments are separated by pilasters. Today's neo-Gothic facade was in the 19th Century added. 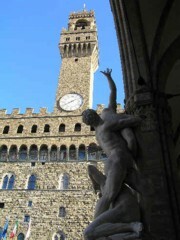 The Piazza della Signoria is a large and central square in Florence, the capital of Tuscany. In the middle Ages, the piazza was the political centre of Florence. The Signoria was the city government and had its heardquarters in the Palazzo della Signoria, which is called Palazzo Vecchio since the time of the Grand Duchy of Tuscany and dominates the great square. 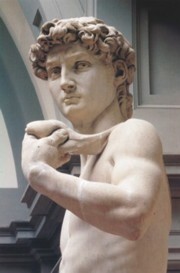 On the square are a copy of Michelangelo's David (The original is kept in the Accademia Gallery since 1873), the Neptune Fountain by Ammanati and other works of the Renaissance. Here you can find masterpieces of sculptures like the Bronze Perseo by Celini and the Ratto by Gianbologna delle Sabine. A passage leads from the square to the Uffizi Gallery. The Accademia Gallery is probably the best known of all galleries in Florence thanks to Michelangelo's David, which has been removed after 400 years from the Piazza Signoria and issued in a hall that was built specially for him. Here can also be admired other works by Michelangelo like some of the “slave”-series his sculpture of San Matteo. 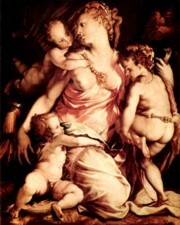 There is also issued a wonderful collection of paintings from the 13th – 16th century. Cook beans with Liquamen, oil, leek and spices. Serve.